Sean Astin is ready for a break. Time to take a load off. Put up his hairy, latex feet. Empty his pockets of Lembas bread and Elven rope and cozy up next to the fire. 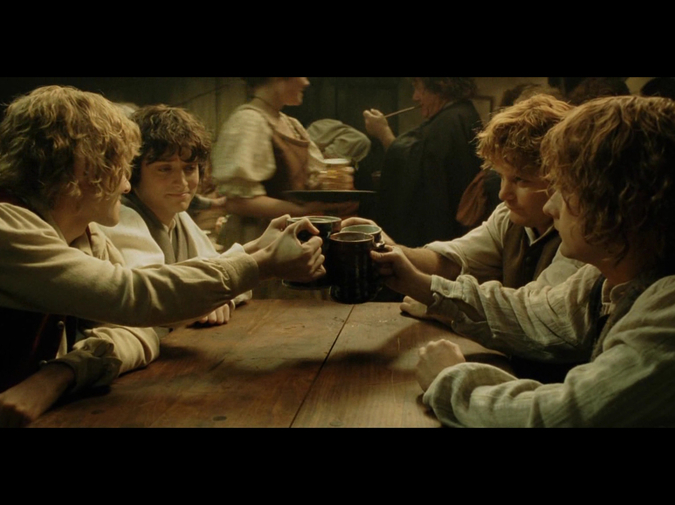 Join the other Hobbits down the pub and grab a pint of ale. (Well, it does come in pints, but adjusting for Hobbit scale, it’s more like half a cup.) It feels good to be in a place full of people, real people dancing to fiddle music, talking about the cabbage crop over by the bar, telling jokes to pass the time. A priest, a rabbi, and a ring wraith walk into a bar. How many wizards does it take to screw in a candle sconce? Why do Dwarven boats have glass bottoms? It’s refreshing. For weeks it’s been nothing but green screens, rolling around on Styrofoam rocks, wrestling with men in latex body-stockings covered in ping pong balls, pretending that a tennis ball on a stick is a giant, bloodthirsty spider. But now, hearth and home again. Back to normal. Except that things are not the same. They can’t be and they never are. In one of The Return of the King’s many endings, the four Hobbits ride back into the Shire victoriously, proudly wearing the armor of distant kingdoms, their ponies laden with exotic gifts and prizes. The locals are decidedly unimpressed, sneering from behind their wheelbarrows and hog pens. One of the major accomplishments of the Lord of the Rings films is the way Peter Jackson is able to evoke nostalgia in the closing scenes of this third movie, nostalgia for the opening moments of a film you first saw only two Christmases ago (if, like me, you lined up for the Midnight screening on opening day, shivering in the air conditioning of the multiplex in suburban Atlanta’s perpetual cargo short weather). You feel safe as you watch this scene, as Howard Shore’s lilting Shire theme bounces our heroes down the dirt road home, as the green screens give way to rolling hills—real green, real grass, real people, real costumes, real sunlight, an honest to Gandalf set! It’s not just Sam who is happy to be home. It’s us, too. By the time we get to the bar, though, an uneasiness begins to creep in. With everything resolved, we wonder, why are we still here? If it’s all happily ever after, where is the after? Why aren’t we filing out of the theater yet, our sneakers smacking stickily against the soda-stained floor, picking popcorn kernels out of our teeth and arguing over whether we want Waffle House or Steak n’ Shake for our late night meal? As we watch these four Hobbits who have been through so much share that last beer together, it’s clear that something is not right. You’re supposed to be paying attention to Frodo, who casts his eyes downward after they raise their glasses. He seems distracted. He’s spending his days not loafing in the grass, but writing a ponderous novel in his dank hole. Soon, Frodo will be leaving Middle Earth forever, sailing across the sea on a ship piloted by Elves, one of the Western canon’s more ponderous metaphors for death. Personally, I never connected with Frodo, a hero who is such a cipher, such a blank screen on which the viewer is meant to project oneself, that he may as well be the faceless hero in a video game. He is less a character than he is a camera lens. Instead, I’m watching Sean Astin, whose Samwise Gamgee is sort of an under-appreciated den mother figure for the “No Girls Allowed” Renaissance Fest club house that is the Fellowship of the Ring. The Hobbits raise their pewter tankards, creamy white suds spilling out over their rims, and take that first, delicious sip, the happy hour to end all happy hours. The other three Hobbits hold their tankards by their handles, clutching them in strong, masculine grips, thirstily pouring suds down their throats. But Sam is more tentative. He holds the stein at the top, by the rim, tilting it gingerly against his lips, taking the tiniest of teacup sips. He isn’t in his element here, in this bar. Frodo, the heroic “ring bearer”; Merry and Pippin, decorated with medals and honors from foreign kingdoms; and Sam, whose chief accomplishments in the War of the Ring have been explaining what potatoes are to a goblin and asking Frodo if he was craving strawberry shortcake. Among warriors, among men who swing from chandeliers in barrooms, who dance and laugh and throw up in the corner, he feels insecure, out of place. Maybe he should have stayed home all along. One morning, late last summer, I got a phone call not long past midnight. My younger brother, Tim, back in Georgia, where it was after three in the morning. That type of phone call can only go two ways: either something has gone horribly wrong, or someone is drunk and feeling lonely. Any other night, I probably would have been awake, not even close to my bed—not necessarily out raising trouble, but at least watching Star Trek in my pajamas with a glass of whiskey. But on this particular night, work to do in the morning and several milligrams of Melatonin coursing through my veins, I was passed out. I wasn’t sure what to make of my brother’s name when it appeared on my smart phone screen. By the time my brain puzzled out what I was doing awake, I'd missed the call. By the time I stepped out in the hall to keep from waking Meagan, my brother had left a message. Tim was only about four when my mother and her three children—what was left of our family—moved south from Michigan after my parents’ divorce. Because he’s been so long in the South, he’s the brother who’s most absorbed the rhythms of the place in his speech, his mannerisms. When I listened to this message, he sounded so Southern to me, his drawled words sliding out so casually in between the long exhales as he smoked his cigarette out there in the humid night. The cell connection wasn’t good enough for me to hear the night bugs chirping in the tall, skinny, south Georgia pine trees, but my nostalgia did the work. Hearing his voice made me homesick, a feeling I never imagined I could feel for such a begrudgingly adopted homeland. Tim immediately put to rest my fears that the call might be some bad car accident, some barroom brawl, some trip to the drunk tank. None of the Sailor brothers live particularly hard, but if any of us were to end up in those decidedly middle class dire straits, it would be Tim. (The only 3 a.m. call I can imagine from my brother Christopher would be to inform me about some new set photos of Daniel Craig in the next Bond movie, some new leaked Pearl Jam track). “You need to have a more…authoritative voice message,” Tim said. My longing for the South so great that my mind transmogrified his almost imperceptible drawl into something more akin to Waylon Jennings narrating the exploits of the Duke boys. “That’s about the quietest damned voice message I’ve ever heard.” I listened to my outgoing message later, and he’s right. It’s tentative, like I’m whispering between the stacks in a library, like I’m Oliver Twist gently pleading for more gruel. In the last ten years—years, I’m ashamed to say, when I’ve been in less and less touch with him—Tim has become less the awkward, hyperactive kid I remember growing up with and more of a self-assured man. He’s able to move through the world with a confidence that, frankly, I find myself lacking. A few months after this call, Tim and I will be in Austin, Texas, to visit our eldest brother, Chris, and check out the Austin City Limits music festival. In the car, Chris, my mother, and I are comparing our various anti-depressant prescriptions and mental health diagnoses, a sort of middle class neurotics’ version of the scene in Jaws when Brody, Quint, and Hooper compare their scars. “I don’t really have any of those problems,” Tim says, when his turn comes. He works as a bartender in Milledgeville, the same college town in South Georgia where he went to school. He has an ease with people, an ability to enter social interactions without anxiety or fear that is somewhat alien to me. Later, in Austin, we’ll enter a bar where Tim will chat casually with the bartender. It’s the sort of exchange that I’ve felt unable to enter into my whole life. In a very real way, I’ve always felt out of place in these kinds of bars, sitting on the stool, chatting with the bartender as if I know something, as if I have something to say about what it is to be a man, as if I belong to this world of knowing which beer to order without consulting a list, of knowing which swear words to yell at the football game at which times. Tim doesn’t have this insecurity. Or at least, he doesn’t show it. He knows where he stands in the world—which parts of that world are his, and which parts never will be. Later in our trip to Austin, we’re all headed to get barbecue. I’m sitting in the front seat of the rental car while my mother drives. On the radio, I’m listening to an ad for a local cardiology clinic. The voice, warm but urgent, is talking about the importance of regular visits to the doctor to ensure proper heart health. As I listen, my own chest begins to tighten. My heart is beating faster and faster, a beat for every white line on the highway zipping past the rental car’s bumper. What I feel then, is something like I am being packed tightly into a can, except that the force is coming from inside of me rather than outside. I am the headlights, their twin spots shining on the roadway, the darkness closing in around me. My heart—not the Valentine shape, not the place where my soul lives, but literally, the beating lump of muscle and gristle at the center of my chest—it becomes something compact but infinitely heavy, like a black hole sucking the strength out of my head and my arms. Or I am Frodo. I have put on the ring. My skin is pallid, moistened with sweat. The world rushes by, black and cold. Distant, like the sound coming out of a seashell. My edges are undefined. They are bleeding out, seeping away into the darkness that surrounds me. We get to the barbecue place, where every sip of beer thickens my blood, every bite of bone-in meat fills my arteries with sludge. I can feel it with every swallow. I am becoming swollen, ready to burst. I breathe slowly, in through my nose and out through my mouth, trying to tell myself that nothing is happening. It isn’t real. There is nothing wrong. That’s not true, of course. There’s a lot wrong. I am sick. I am in trouble. I am having a panic attack. Growing up, Tim and I were very close, even though we didn’t always get along particularly well. Chris, being the eldest, got a room to himself in the three bedroom apartment we grew up in, leaving Tim and I to share a room for most of our childhood. Anyone with siblings can fill in the blanks there—wild swings between being best friends and worst enemies, between misbehaving together and running to Mom to rat out the other’s misbehavior. We had a reputation for being unruly. According to one family legend, one of our Aunts, stuck babysitting us on a week off from school, lost her patience with our constant bickering and fighting, shouting, “You’re ruining my sister’s life!” But when I think about those days with my brother now, I don’t think about fights and bruises and body slams from the top bunk bed. I think about staying up past our bedtimes to watch monster movies on cable, sneaking out to the kitchen to warm up pizza bagels, hoping the DING! from the hefty 1980s Sherman Tank of a microwave didn’t wake our mother. Or playing through Super Nintendo RPGs, taking turns navigating tiny character sprites through mountain ranges and deserts. Or reading an Illustrated Classics version of Frankenstein to him before bed when he wasn’t quite old enough to read. This is the childhood Tim evokes in his transcontinental voice message, telling a story about a night I hadn’t remembered, back when we were teenagers. Tim was incredibly brilliant—he could tell you anything about insects and animals at age 5, read Freud recreationally in early high school, devour Lovecraft and Tolkien novels and then quote the most arcane passages back at you. He struggled, though, with the rigid structure of classes and schoolwork. He couldn’t bring himself to complete homework or take home projects. He’d get into epic arguments with my mother trying to avoid his assignments. On one particular night, after one of those protracted battles with my mother, he came into our bedroom, crying and screaming. I pretended to be asleep at first, but eventually I couldn’t bear to. He was lying in bed, sobbing. I don’t remember what I told him exactly, other than that he was right, and he shouldn’t give up, that he was too smart to let it get to him. I wouldn’t have remembered it at all if Tim hadn’t told me the story that night, over the phone, years later. “I love you brother,” he said, at the end of the voice message. “You taught me everything I know.” By now I am sitting on the toilet, holding the phone to my ear in the single lighted room of a dark apartment. I am crying. I am full of warmth and love. My brother is here. He has come to save me. The Lord of the Rings movies got to me young, and they’ll never let me go. They exert a nostalgic pull that I can’t resist no matter how many terrible prequels are released, no matter how poorly some of the green screen shots have held up. My brothers and I used to watch them together. We’d get the DVDs as they were released just before Christmas and hole up in one of the bedrooms of our mother’s house, watching them late into the night while our mother baked cookies or wrapped presents downstairs. We were slightly too old to be doing this, but we also held on greedily to this last semblance of childhood. To this day, I’ll watch any of these movies through to the end any time they come on television (i.e., literally every single Sunday afternoon on TNT). Like any fantasy epic, they’re full of violence, full of men proving their heroism by murdering creatures with rubber faces, mo-cap faces, procedurally generated faces. And I’m not going to try to tell you that I don’t enjoy watching Viggo Mortensen wipe blood off of his sword, or seeing John Rhys Davies slice the heads off of orcs with his axe, or suspending my disbelief as a tiny digital cartoon with Orlando Bloom’s face tacked on runs up the side of an elephant. But none of that is what keeps me coming back, time after time, hour after hour after hour, Sunday afternoon after Sunday afternoon. I want to see Viggo Mortensen, petals falling down around his crowned head, telling the four Hobbits that they no longer need to bow. I want to see Sam hoisting Frodo on his shoulders, promising that he will carry him when all his strength has failed. I want to see Sam drinking his half cup of beer, smiling bashfully at his friends, believing for one fleeting moment that his troubles are at an end, that his pain is over. We don’t teach men how to love. Especially not each other. I’m no better, even though I feel that I should be. I’ve lived most of my life in the shadow of a father who didn’t love me well enough. Shouldn’t I, of all people, be able to easily overcome that most cliché of male shortcomings? It shouldn’t take the end of the world for one man to tell another how much he loves him. It shouldn’t take fire and flame and poison and blood, or 3 a.m. delirium and seven Jim Beams. I love my brother. I want to tell him. I want to say it. I want telling him so to be masculinity. I want the voice that tells me how stupid all of this sounds—even now—to not be quite so loud. I want the fighting to be over. I want the pain the stop. I don’t want to have to say goodbye. I want Frodo to find the strength to live his life. I don’t want him to sail on that ship to the world of bad silver wigs and worse Annie Lennox songs. I want him to take Sam by the hand. I want them to walk home together. I want them to raise another glass in the pub. I want them to stay up all night, telling stories. By the time the sun comes up, neither can remember who began speaking. Which one of them was the hero? Which one needed saving?